Last post 04-09-2019 10:41 AM by rider2. 16 replies. I'm building a new S5 disc and would like to replace the RAT through axles with threaded bolt through axles. My question is does Cervelo make an adapter to allow a threaded front through axle. Cervelo supplies a alternative rear derailleur hanger to allow non RAT's on the rear but I do not see a corresponding front part for the front fork replacement of the RAT. Appreciate the input and any assistance! I have bought a threaded axle from the Robert Axle Project for my S5 front RAT replacement. They have indicated they can supply a bolt for their front axle. Likely an additional charge above the axle but it looks like problem solved. I just saw a S5 and a S3 in person. I kind of like the Rat system. Why do you not? Don, yes the RAT's are quite nice and functional. Just I'm building my S5 to 14.5 lbs which isn't difficult but the RAT's weight 61g F, 68g's R as compared to approximately 60g combined for F&R bolt on through axles. They are low hanging fruit! In Collingwood only have a flat once every two years but in Florida where flat's are common and weight doesn't matter being flat will use RAT's. Also the bolt on's are more aero. Most of my weight savings are seat, axles, groupo (Dura Ace Mech) and my tubular wheels which with tires mounted are over 500 grams lighter than the factory wheels, same depth. Also purchased a second clincher/tubeless set I'm running Continental 5000's in a 28mm on for general use, training, Florida etc which at 50R, 44F are still 120 g lighter than factory E Tap build. My S3 2014 was around 14 lbs but with disc's even though running lighter seat the S5 is going to weight at least half a lb more. Disc's seem to add about one lb to the bike build with rotors, calibers and of course the heavier shifters. Unbelievably good looking bike the new S5, really a engineering tour de force. Looking forward to the handling which appears stellar based on all tests I've read. One of my friends just bought a new Venge which with no pedales and 50F,50R wheels is 14.9lbs on the scales. Will send pictures when I finish build. It's a black frame. When I put my (51) S3 next to a (54) S5 the handlebars on mine are about 1 3/4" (44.5 mm) Higher. At 64 I doubt I will ever be able to get comfortable that low. My S3 was my bike of choice on a VERY windy day to do my Double Century last May. I have been looking at a Red /vBlack S3... The Trouble is... They only offer that in a rim brake as a frame only option. I want to build one. I am not interested in the stock wheels and I want to go E-tap. The one thing I have learned on the flatter roads I ride is that weight is not that big of a deal. My lightest wheels were absolutely not my fastest on my S3 and my P5 is really fast and with the disc and tri spoke on the front a bit on the HEAVY side. I just did a Century in FL at 20.0. I wish I could get that low on the S5. I am going to be working with a new fitter that has the opinion that he has a plan to get me lower on my P5. If that works I am hoping the S5 would work for me. Agree that on flat's weight just not an issue. I've learned over time that if wheels are too light they just do not conserve momentum on the flat's. Prefer wheels around 1300 gram's with most of their weight in the rim as they hold speed on the flat's and still climb very well. Using the 44 front as is fairly aero but also not so deep that at 40-50 mph descent's cross winds don't upset the bike. Really like a front/rear depth stagger, at least for riding here. While a lower riding position is great the truth is helmet, kit and general position are more important than getting low I think. If you can get accustomed to a lower position fine, but not at the expense of power or comfort. Selected a 38mm bar for the S5. Same width as my 40mm 3T Aeronova at least as measured at the hoods. Apparently every two centimetres reduced in bar width is worth around 10 watts at 25 mph and narrow bars tend to make a bike more stable in cross winds which we have a lot of. Was worried that I might need a bunch of spacer's on the S5. But after comparing with my present position on the S3 looks like might need one 5mm spacer or none, Hope I'm lucky! We will see at the fitting. The new S5 bar's are very different dimensionally than my 3T Aeronova's. The new S5's drops are like 1.5" closer (stock 100mm stem) but the front of the handlebar at the center is 1" further forward. Can't wait to get the bike set up but will have to wait till Florida in April to get out on it. Good luck with your fitter. Maybe you can wrap the S3 to your colour choice or of course you could have it painted. Best bike I've ever had is the S3. My R2 has staggered wheels... HED Jet 4+ front (46mm) and HED Jet 6+ rear (60mm). My bars on that are also 38mm. As far a cross winds... I do remember that from COR! The reach on the 19 S3 bars is 10mm longer than my current Zipp bars. They do make the Black &Red S3 in a Disc. They just do not offer it as a frame only as a disc. Thread on my 2019 S5 build: https://forums.roadbikereview.com/cervelo/2019-s5-disc-58cm-di2-build-review-367115.html The rear axle nut from my 2017 S3 disc that slots into the dropout also fits the '19 S5. So I have an rear bolt. Fork appears to be a new for '19 design so no such nut exists AFAIK. I have ordered a spare front fork nut. Plan to scan and reverse engineer with threads for an axle. From there we'll 3D print it from POM nylon (delrin). The OEM R.A.T nut appears to be a similar nylon. If it works, I'll share the CAD file here. 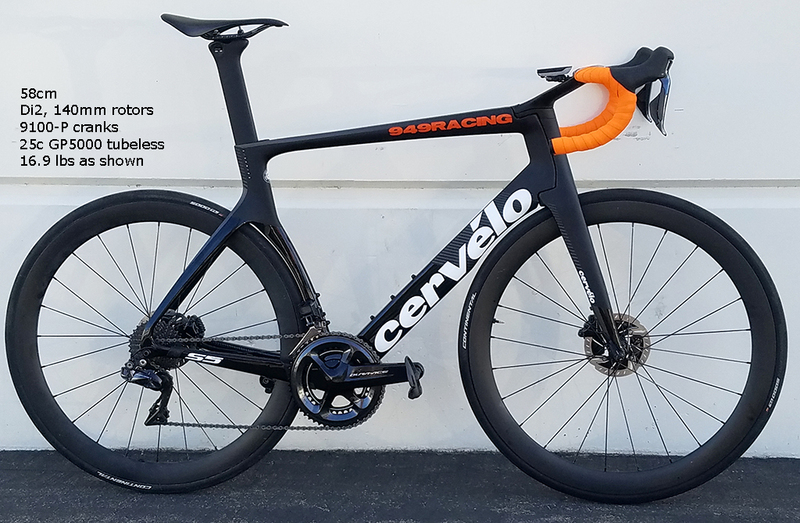 Cervelo mentions "aero axles" in the big manual/white paper for the S5 but last I heard, they didn't have any part numbers yet. Maybe they'll beat me to it. Emillio The Robert Axle group is supplying me with a nut just produced which sit's proud 8mm on the front axle after replacing the RAT fastener. On the other fork it will be flush of course. Total weight with through axle and nut, 35g. This replaces the 61g RAT through axle and the plastic adapter of 4g's or so. On the rear wheel, as I believe you have, replaced RAT with Cervelo threaded derailleur hanger and new threaded through axle. Total weight savings F&R likely in the 70g - 75g range over the RAT's but also a little cleaner. Interested in your comments. Do you plan a cleaner front through axle replacement if so how. thanks. I'm planning to design and 3D print a threaded replica of that little plastic piece, the nut. I'll share info if it works. Well received my front threaded through axle with nut part # LIG519.C from the Robert Axle Project. As anyone knows who has a new S5 Disc and want to replace the RAT through axle there really was not to my knowledge a threaded alternative. I would just like to say the Robert Axle Project threaded front axle replacement (with custom nut) is very nicely done with a weight saving of approximately 31g's and a cleaner aero. While the RAT's are excellent by replacing the RAT's front and rear you do in my opinion clean up the bike and lose 75-80 grams. Also, having built my 54" S5 Disc up from a frame would like to say mine weights 14.6lbs with garmin 500 head unit and my speedplay pedals attached (no bottles) with my tubulars (44Fx55R) and 15.6lbs with my clinchers (44Fx50R) Conti 28's. As far as I can tell the Venge frame actual is only 10g's lighter than the same size S5D. Forks are about the same, our headset and bar's are slighter heavier. Basically the S5D without parts (frame/seat post, seat clamp, bars, stem, headset parts) is 15/100 of a lb heavier than the Venge but the S5D as per Tour Mag is three to five watts faster at 40 (5 watts I believe without RATs). The S5D is also 16% stiffer in the BB than the Venge or Trek (Tour). This bike is well engineered which of course is why I bought it LOL. Having now ridden it for a week which includes one crit it is brilliant out of the saddle and cornering is the best I've tried. Very pleased. Tour Mag test was 2018 rim brake S5, not 2019 S5D. Emillo: Was talking about this years Tour test of the S5D not last years of the old S5 rim.